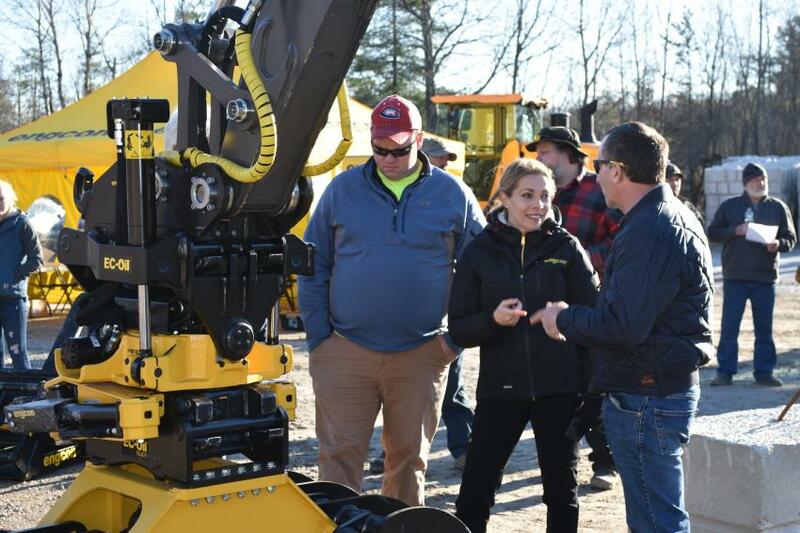 Lorusso Heavy Equipment held a hands-on demo day Dec. 1, 2018, near its facility in Walpole, Mass. 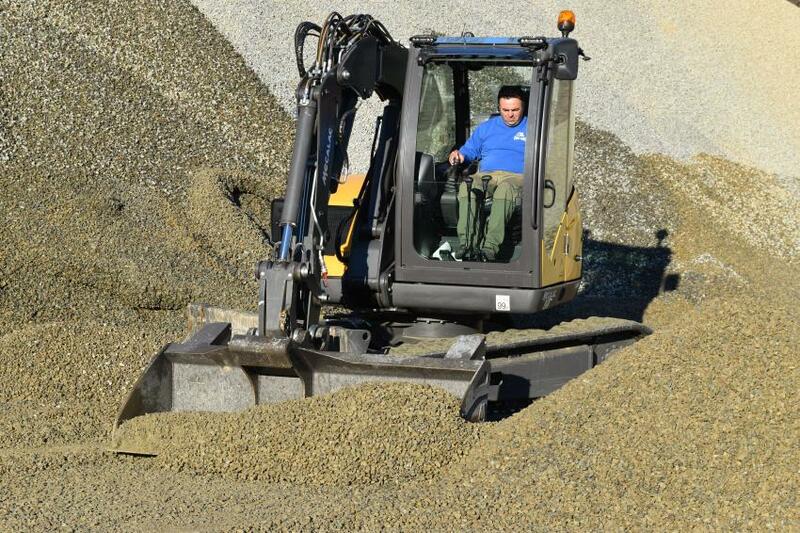 The event spotlighted the Mecalac 8-MCR earthmover equipped with an Engcon tilt rotating system. 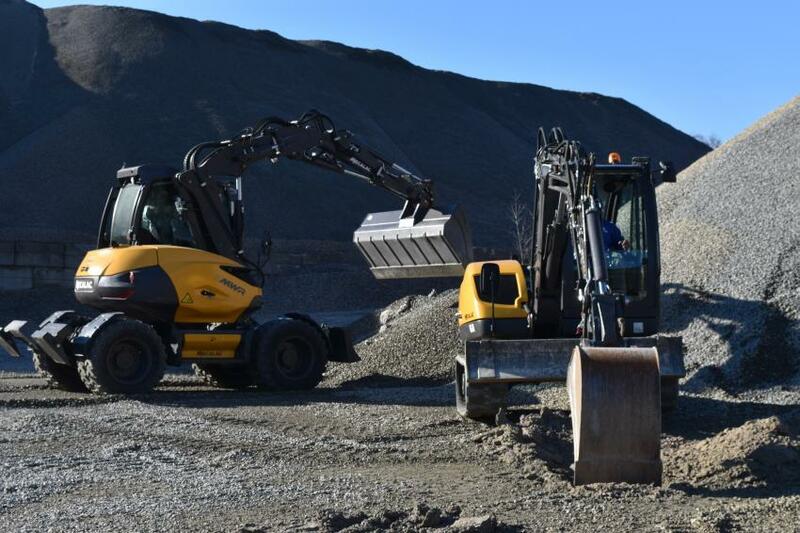 In addition, other models of the Engcon product line were available for a test drive along with various models of Hyundai excavators and wheel loaders. 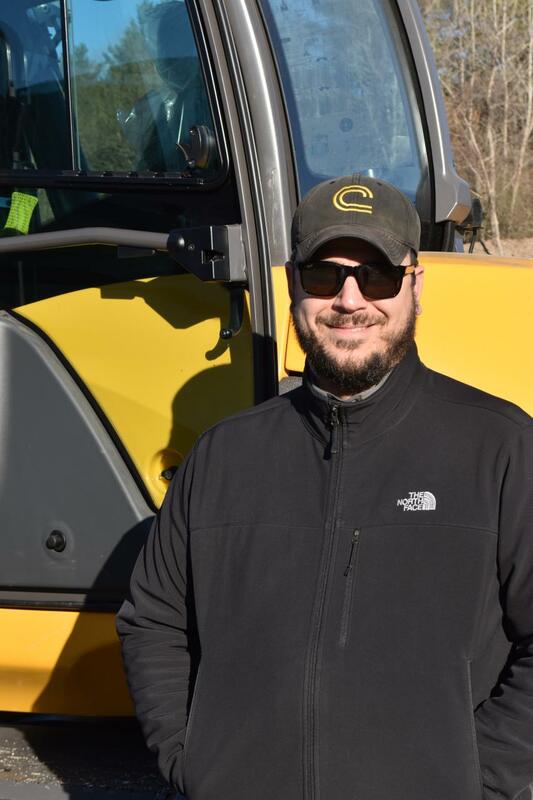 During the demo day, Mecalac owners looking to expand their fleet or enhance their current machine with an Engcon tiltrotator gathered from across New York State and New England for an opportunity to operate some of the newest, most advanced equipment available on the market. 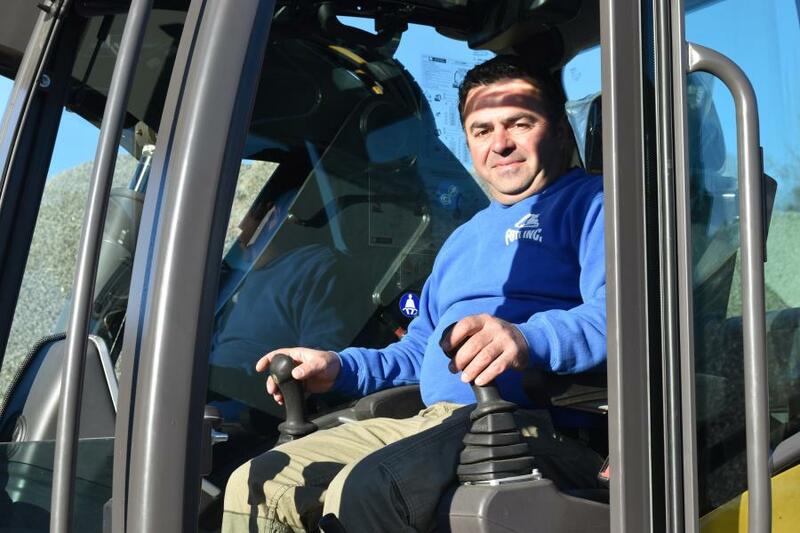 Antonino (Nino) Foti from Rockland County, N.Y., primarily does utility work along with some landscaping. I saw the Mecalac machines on YouTube about six years ago and just looking at the videos, I fell in love with the machine. I had previously made modifications to the attachments on my existing excavators, but I could not get them to work as effectively as the Mecalac. My machines were much slower and less powerful. We were so pleased when Lorusso Heavy Equipment brought Mecalac to the United States and we were able to buy one from a local dealer. Every part of the Mecalac has lived up to our expectations. The controls are very smooth. The machine is manufactured in France and is extremely well engineered. It has a Deutz diesel engine which is powerful and reliable. I came to today's event to look at the MWR series wheeled machines. I have never had the opportunity to see one before. Our business is strong, and we have a lot of work lined up. I'm very impressed with the wheeled excavator. If we are doing urban work and need to move from location to location within that environment, it would be the ideal machine. The unique design of the boom will allow you to work in lower clearance areas without concern for hitting overhead wires. Since we have purchased the 6-MCR we are getting our jobs done 30 percent faster. I can scoop material right out of the back of a truck without making any sort of a mess. For backfilling, this machine is like a dream. At the end of the day, you don't feel like you worked … you feel like you played for a day. I like to compare it to driving a finely tuned European race car. I also just purchased another 6-MCR. 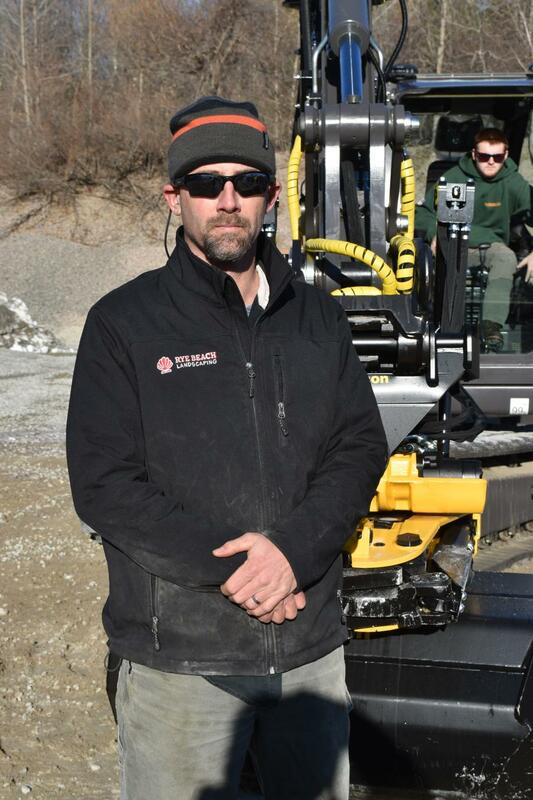 Ben Holmes of Rye Beach Landscaping does landscape construction and excavation. I bought my Mecalac 6-MCR in 2016. I put a snow pusher on it right away. 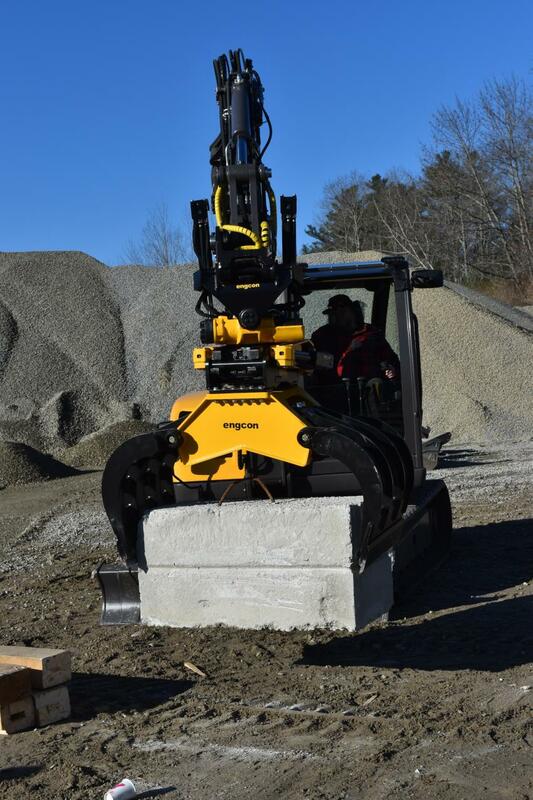 The weight transfer and traction are wonderful, and it is very effective because you can ramp piles with the boom that you could not do with a skid steer or a loader. You can reach farther, and you can swing and adjust as you go down a travel lane. You can't do that with any other machine. Having a machine that can do so many tasks has increased my efficiency and saves labor and time. The learning curve to use was very short. I have put about 1,500 hours on it and have only had a couple of minor issues that the dealer fixed right away. We are looking hard at purchasing an Engcon tiltrotator. It would expand our applications even further. It will be our next purchase. It takes a machine that is already a Swiss army knife and makes it even better. The Mecalac has been a big labor saver for us. Anytime that you can expand the functions that you can do with a single machine, you automatically reduce your labor time. We have generally been able to go from using three-man installation crews to two-man crews, and the Mecalac has been the key to reducing our dependence on manual labor. Jason Catalano of Catalano Construction, Cumberland, R.I., attended the event to look at a Mecalac with an Engcon tilt rotating system. 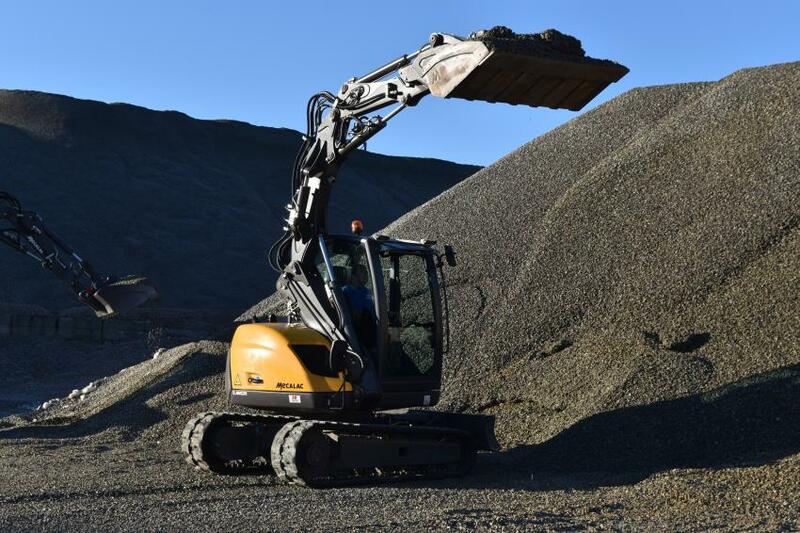 With the three-piece boom design, attachments are more flexible than ever before on the Mecalac MWR series wheeled machines. Prefer to shovel versus dig? No problem. 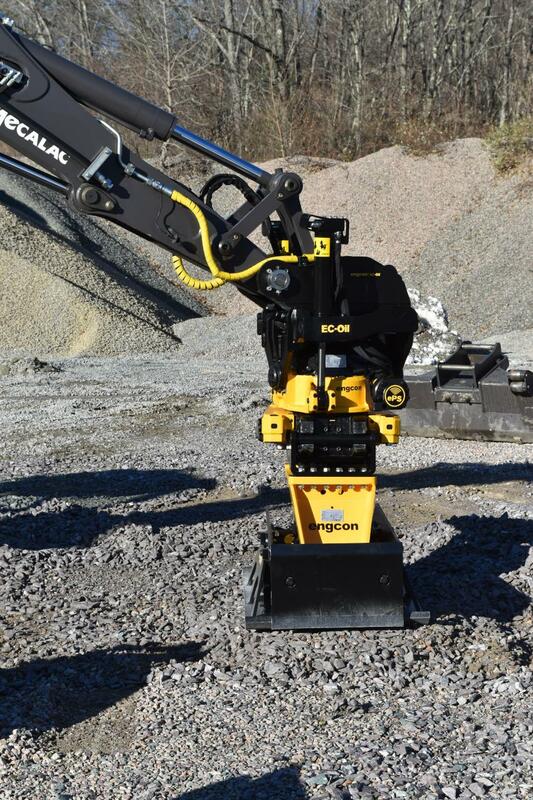 The Engcon 360-degree tilt rotating attachment system even offers a vibratory compactor that can be changed out in seconds without leaving the cab. 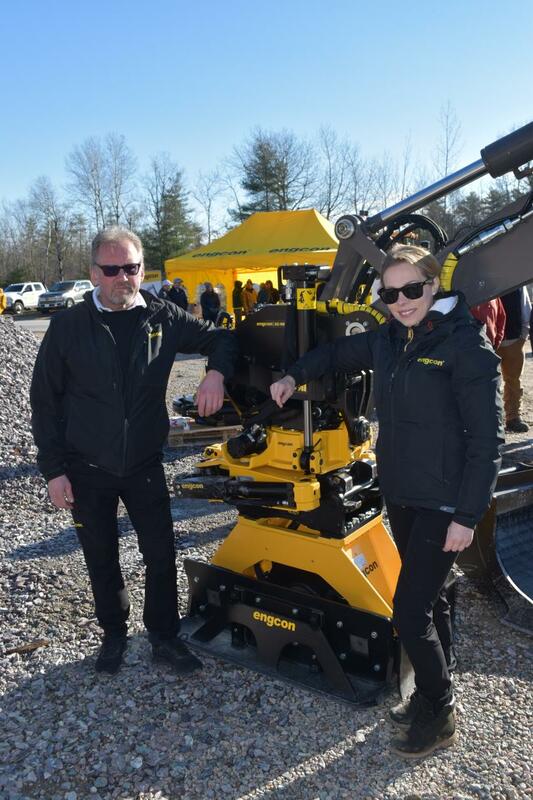 Representing Engcon during the event were Ake Johansson, product specialist, and Joanna Tomczyk, North American director of sales. Add this team to your fleet and you will be limited only by your imagination. Looking for flexibility that in the past could only be imagined without sacrificing power? Check out Engcon. 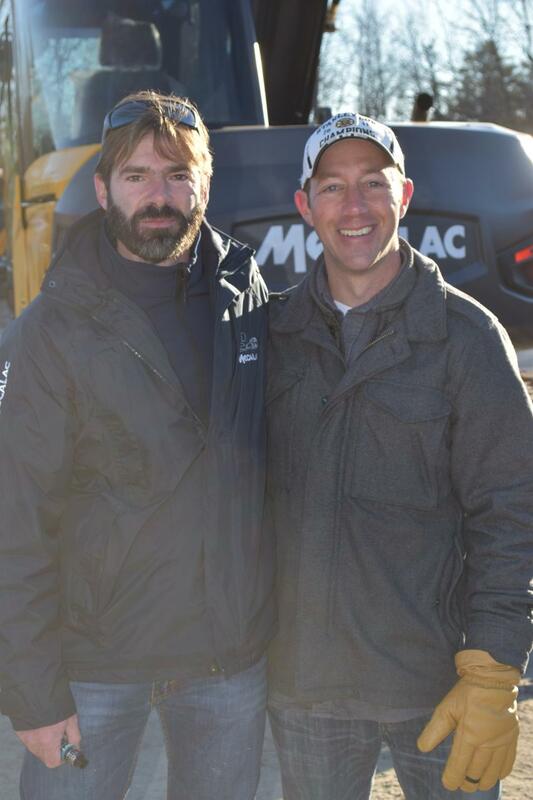 Frederic LaBorde (L) of Mecalac welcomes customers with Paul Lorusso of Lorusso Heavy Equipment. 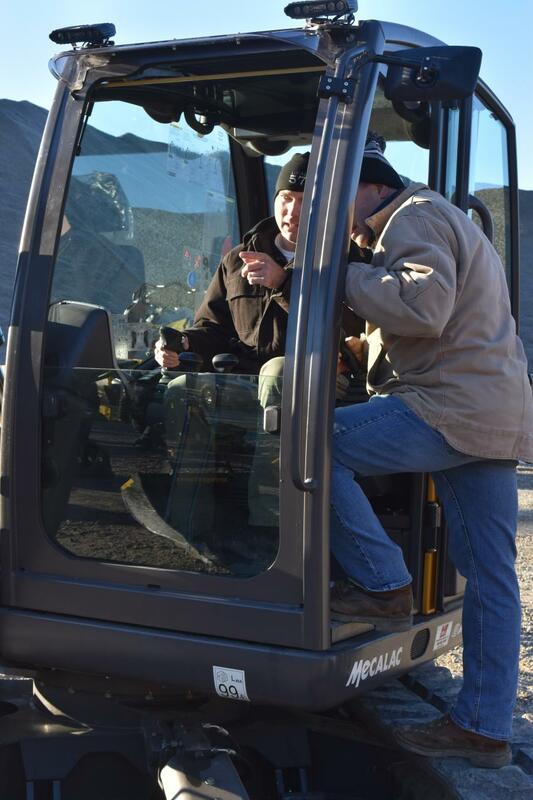 Jim Capiobianco, sales representative of Lorusso Heavy Equipment, reviews the controls of the Mecalac 8-MCR with Joe Chabot, equipment operator of Catalano Construction, Cumberland, R.I. 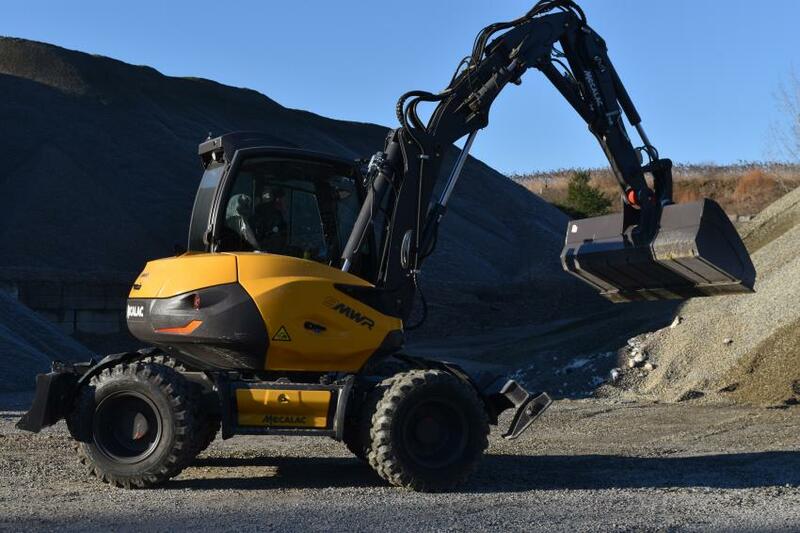 The Mecalac 6-MCR excavator skid steer hybrid gets put through its paces. Brand new to the U.S. market are the Mecalac MWR rubber-tire machines. 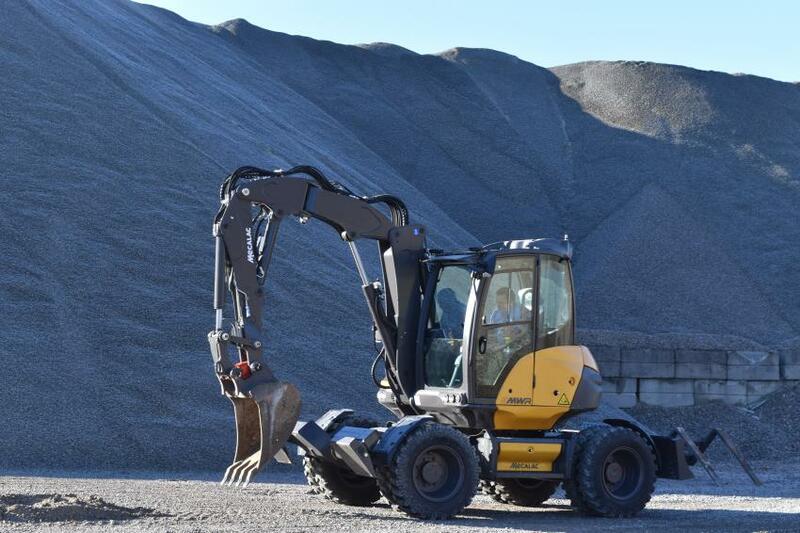 The unique boom design of the Mecalac 6-MCR allows it to push more powerfully than a traditional skid steer. 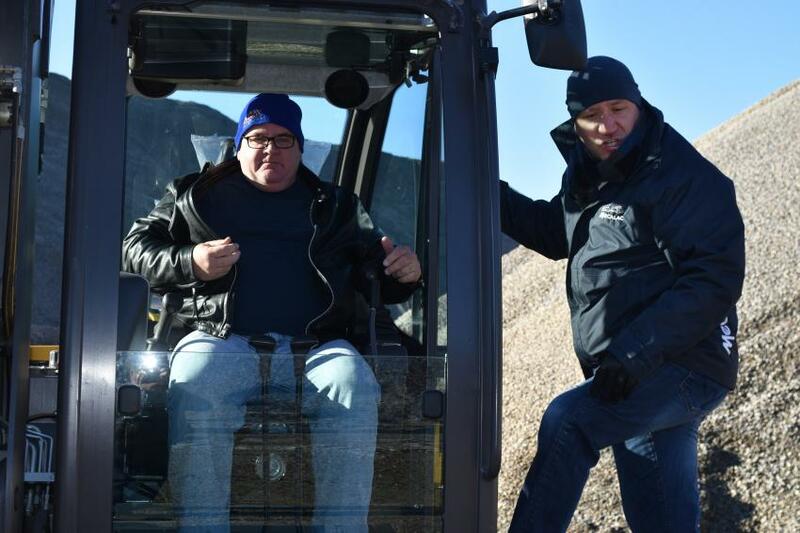 Interest was so strong in the Engcon system of attachments that Joanna Tomczyk, Engcon North American director of sales, never had an opportunity to take a break.